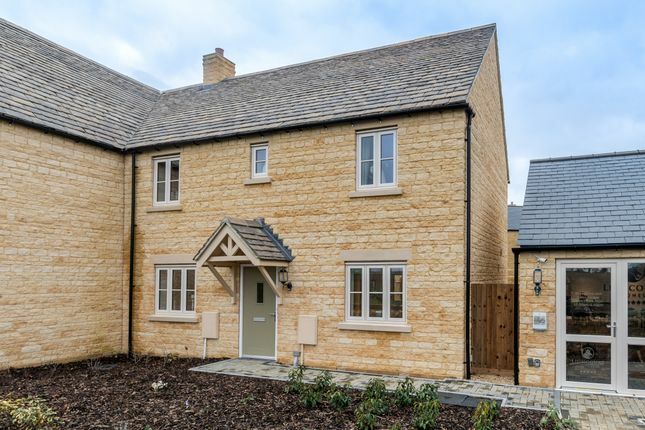 Description The Alder is an attractive semi-detached home with countryside views situated on the prestigious new Regency Walk development located on the rural edge of Tetbury and positioned with a delightful countryside aspect to the front which takes in the sunrise. An entrance hall houses the WC and leads to the open plan kitchen/dining/family room, off the kitchen there is a utility room with a useful under stairs store and a door to the garden. There is also a spacious living room off the entrance hall with glazed doors leading out to the rear garden. Upstairs there are three double bedrooms, with the master bedroom having an en suite shower room, as well as a family bathroom. Externally there is a good sized rear garden with a westerly aspect, a single garage and an off road parking space. To the front there are lovely countryside views and the front door is accessed via a pretty tree lined path. Property descriptions and related information displayed on this page, with the exclusion of Running Costs data, are marketing materials provided by James Pyle & Co, and do not constitute property particulars. Please contact James Pyle & Co for full details and further information. The Running Costs data displayed on this page are provided by Homes24 to give an indication of potential running costs based on various data sources. Homes24 does not warrant or accept any responsibility for the accuracy or completeness of the property descriptions, related information or Running Costs data provided here.